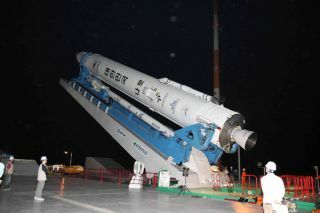 South Korea readies its new Naro 1 rocket for a June 10, 2010 launch that ended with an apparent explosion just minutes after liftoff. South Korea's second attempt to launch a rocket intospace failed early Thursday when the booster apparently exploded just minutesafter blastoff, according to South Korean news reports. The new Naro-1rocket likely exploded about 137 seconds after launching from South Korea'sNaro Space Center, said Ahn Byong-man, the country's minster for education,science and technology. It is the second consecutive rocketfailure for South Korea in less than a year. "Talks are underway for a third launch of therocket," Yonhap quoted Ahn as saying. A pre-existing agreement called onSouth Korea to launch a third rocket if the first two failed, Yonhap reported. South Korea's Naro 1 rocket is a two-stage booster thatstands about 108 feet (nearly 33 meters) tall. It consists of a Russian-builtfirst stage and a South Korean-built second stage. Naro-1 was carrying ascience satellite to make Earth observations. The rocket's launch had already been delayed from a Wednesdayliftoff when a fire suppressant system unexpectedly switched on during thelaunch countdown. The Naro Space Center is located in Goheung, about 290 miles(465 kilometers) south of Seoulon South Korea's southern coast. The Naro-1 rocket's failure comes on the heels of SouthKorea's first rocket launch mishap during the August 2009 test of the KoreaSpace Launch Vehicle 1. That first test rocket failed to reach orbit afterliftoff when the protective shroud covering its satellite payload did notseparate properly.